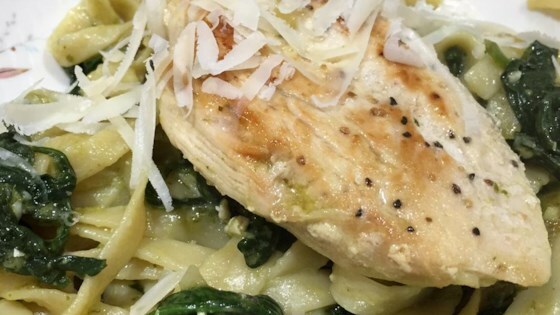 "This restaurant-style chicken and pasta dish is beautifully seasoned with spinach and pesto sauce...and since it cooks in just one skillet, clean-up is a breeze!" Reduce the heat to medium. Add the onion and cook for 3 minutes or until tender, stirring occasionally. Stir in the broth and pesto sauce. Add the spinach. Cover and cook for 5 minutes or until the spinach is wilted. Stir in the fettuccine. Return the chicken to the skillet. Cover and cook for 5 minutes or until the chicken is cooked through. Sprinkle with the cheese, if desired. Made per recipe, I'll give this three stars. However, this has potential, so I will definitely try again adding more flavor (fresh garlic, pepper, perhaps). This is a very easy recipe but quite tasty. I added the pesto slowly to my taste as well. I didn't want it to overpower the dish. I think adding fresh tomatoes would have been a good addition.